Delegate Cindy Lavender-Bowe, D-Greenbrier, left, listens to Delegate Mick Bates, D-Raleigh in the house chambers during the first day of the legislature session at the State Capitol in Charleston. 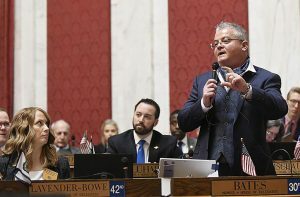 BECKLEY, W.Va. — West Virginia may join Vermont in putting pressure on the federal government to take action to reduce prescription drug prices. The Health and Human Resources Committee in the House of Delegates passed a bill this past week that would ask the state Department of Health and Human Resources to begin a program to import cheaper prescription drugs from Canada, which more strictly regulates drug prices. The legislation is already on Monday’s agenda for the House Judiciary Committee.